I have covered so many things focused on the essentials of being prepared for emergencies as well as being ready to evacuate. However, there are some tips that just don’t fit in those two categories. 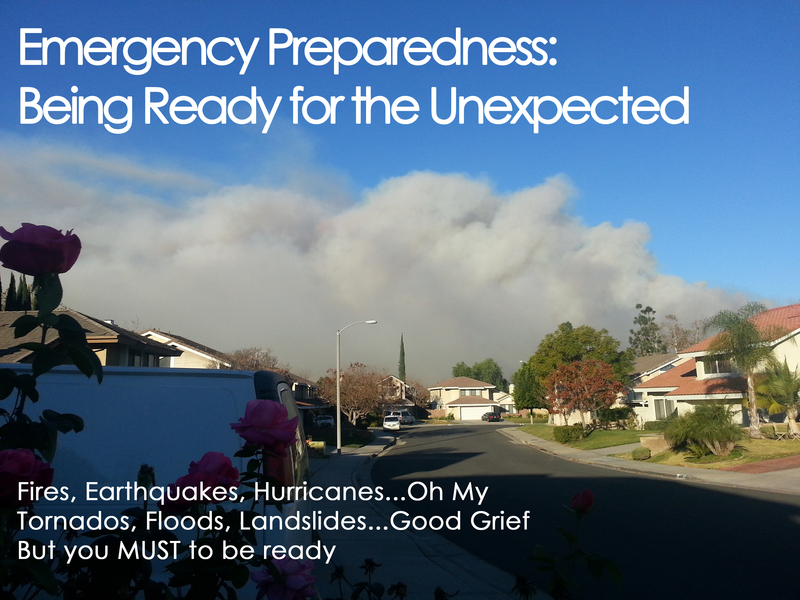 In doing my research I found a variety of different little and simple things you can do to get prepared in advance of an emergency as well as some things to consider during a hunker down situation. These things are “to dos” in addition to what I have already shared like your emergency binder, your 72 Hour Kit, etc. Gather books, board games, cards, coloring books and other non-electrical forms of entertainment. Also, trying picking a night a week or a night every two weeks that you and your family play or enjoy one of these entertainment sources. Not only is it fun family time but you also get kids use to non-electrical entertainment. Get a fire extinguisher. Find an all-purpose or get a couple as not all fires are the same. Keep your gas tank full. You never know when you will have to leave in a hurry. Stock up on batteries. Dollartree and 99 cent store have packs of batteries in all types that are really cheap…a $1. Invest in a crank radio. You can listen for updates and news without using vital battery power. Save your batteries for flashlights and similar. Make sure you have a car charger for your cellphone. When power goes at least you can charge your phone. Plus if you find yourself stuck or your car breaks down, your cellphone can be a life line. Better yet get a solar powered cellphone charger. You can still get a charge even without electricity. I know many of us have forgone the old fashion land lines and good ole plug in phones (think the ones with button and handset wired to the base versions) but these can serve you better in emergencies than cellphones since phone lines still work even when electricity is down. Make sure you put a list of hand written emergency contacts, family member’s numbers and emergency numbers by the landline or if you elect to not have one, put them in an easily accessible location. Ask yourself, if your cellphone died, whose numbers would you remember? Look into and invest in solar power exterior lights. These make a great way for you to have light indoors at night and also lights path ways in the immediate. Just remember to put them back outside each day. You can usually find some for $1 a piece at Dollartree or 99 cent store during spring and Target occasional has them pretty reasonable as well. Speaking of electricity, make sure to keep your electronic devices charged. Since a lot of non-perishable foods are canned, make sure you have a standard non-electric can opener. Turn the temperatures on your fridge and freezer up as cold as they will go. If you lose power, your food will be preserved longer. Stock up on wet wipes, hand sanitizers, mouth wash and dry shampoos to help in the healthy hygiene department. Stock up on can goods, nonperishable food, snacks and meals that can be eaten easily in emergency situations. If you have space in your freezer, consider filling it with zip loc bags and/or bottles filled with water. These can be unfrozen to use in emergency situations. If you live in a hurricane or harsh storm area, make sure you have plenty of wood to board up windows. Check electrical, water and gas lines every two months or so to make sure they are in good condition. If they are not, call your local service to have it repaired. If you have a chainsaw, get some practice in before a storm. You don’t want your first time to be after a disaster where emergency personnel are most likely going to be stretched thin. Keep storm drains in front of your house and gutters free of debris. Clogged drains and gutters can cause flooding during heavy storms. Speaking of rain, think about getting large rain barrels or similar bins to catch rain water. This can be used for toilets and worse case scenario can be boiled (for a long time) into drinking water. Stock up on candles and matches too. They are a low energy lighting source. Speaking of candles, make sure to have the small non battery or non electrical powered carbon monoxide detectors. If you wear contacts, make sure you have a spare set of glasses and keep them by your bed. The last thing you want to do is be trying to get your contacts in during an emergency. Know how to manually open your garage door. If electricity goes out, this can be the only way to get your car out. If you feel it is reasonable, you may want to park outside your garage if you know a disaster is coming in case you have to evacuate fast. If you have elderly people in your family, help them be prepared. Make sure you have pet leashes or carry cases on hand and easily accessible. You can grab them and go. Making sure you know where your pets are is a sure piece of mind. Turn off the TV. Your shows will not be running and neither will kids cartoons. The news will however raise anxiety and stress which is not good for you or your children. If you need updates, listen for what you need and then turn it off. Not only are you keeping people calm but you are also preserving power (in case you are on a generator). As a reminder, if you lose power, try to refrain from opening the fridge. silicone the stopper in the bathtub and sink and let dry at least 30 minutes. Then fill the tub and sink with water. Close and lock the door to keep pets and children safe. fill your large buckets with water for toilets or “spit baths” to keep clean. I read that you can use your water heater for extra water too. Shut off the intake valve to prevent contamination, then use the spigot for water when you need it. If you are afraid of flooding, consider putting items into the dish washer since it is leak proof, therefore it is waterproof. If you use your fireplace, gas appliances or cooking tools, propane heaters, candles or other items that give off carbon monoxide, make sure to put your detectors out. Carbon monoxide is a silent killer so make sure to check them often. If you are expecting a heavy storm, board up your windows. In tornados, hurricanes, heavy rain storms, etc. stay away from windows, even boarded up windows. Consider having everyone stay in one room, especially when you go to sleep so that you can be confident of where everyone is if you have to evacuate fast. If you know a storm or disaster is approaching, make sure to do your laundry. If its cold, these cloths may be needed to keep warm. If its a long term emergency, this could be the last chance you will have for clean clothing. If a storm knocks down trees and you are experienced with a chainsaw, it can help clear the way. If you don’t have a chainsaw or are not familiar with it, then a hand saw can clear reasonably sized debris. If electricity is out, make sure to conserve your generator power. Use it for needed things only like cooking. Remain calm. The worst thing someone can do is panic. Hope this helps. You can take the “in advance” tips one at time to slowly but diligently get prepared. See you next post. In my next post, I will be looking at pets and what things to consider with respect to them and emergency preparedness.